With a population of about 23,000, Siwa, the most inaccessible of all Egypt's oasis until very recently, is also one of the most fascinating, lying some 60 feet below sea level.. On the edge of the Great Sand Sea, its rich history includes a visit from Alexander the Great to consult the Oracle of Amun in 331 BC. Archaeologists, such as Liana Souvaltsis implied that the great military leader was burried here, but no real evidence has come from this. The King of Persia lead a 50,000 man army to the area to distroy the oracle, but the entire army was lost in the desert. The area has a nice climate, chilly in winter, hot in the summer and moderate in the spring and autumn. Lake Siwa to the west of the town of is a large, saltwater lake. The area is famous for its dates and olives, and is one of the most beautiful landscapes in Egpt. Olives oil is still made in the area by crushing the olives from the 70,000 olive trees in the area with stones. The dates are gathered by zaggala (stick bearers), who must remain celibate until the age of forty, and the area boasts some 300,000 date trees. It is located on the old date caravan route, yet until recently, it received few other visitors and retained much of its heritage. 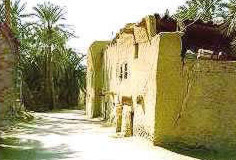 In fact, until the battles which took place around the oasis in World War II, it was hardly governed by Egypt, and remained mostly a Berber (Zenatiya) community for the prior thirteen centuries. Siwans continue to have their own culture and customs and they speak a Berber language, called Siwi, rather than Arabic. Interestingly, each October there is a three-day festival during which Siwans must settle all of their past year's disputes. The area is also famous for its springs, of which there are approximately 1,000. The water is sweet, and is said to have medical properties. Though relaxing and certainly now a part of the tourist community in Egypt, it is very traditional, and visitors should keep this in mind when traveling to the area. Girls of the area are often married by the age of 14, and afterward where completely covering clothing, and allowed little communications with the world outside their immediate family. Many women still wear traditional costumes and silver jewelry like those displayed in The Traditional Siwan House museum in the town center. In fact, the area is also well known for its crafts, particularly woven cloth, which is unique in Egypt. International flights direct to Cairo, then either an internal flight (see below) or overland by bus or by car. You may like to book a tour through a travel agent or hire your own transport. Bear in mind that desert driving has special requirements and be sure to get a suitable vehicle and guidance on possible hazards. 0therwise you can travel to each location by bus or service taxi and arrange trips from there. Train, flight or bus to Alexandria then a bus direct from Alexandria or via Mersa Matrouh. Siwa contact the Siwa Information office on +20-3-933192/931841 ext. 7.